The First Lady Jeannette Kagame has asked students to be active citizens who put forward positive change in their communities. The First Lady who is also the chairperson of Imbuto Foundation was addressing students under Imbuto Foundation scholarship project ‘Edified Generation’ during the closure of their annual holiday camp at Groupe Scolaire Mater Dei in Nyanza District. The camp trains students on social and economic activities including; saving, public speaking and leadership among others. “The government has put every possible means for you to get education. 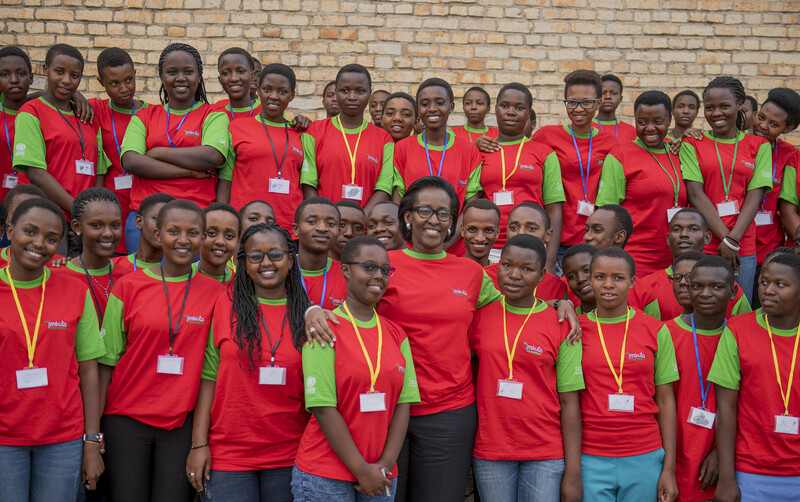 You should realize this opportunity and learn, have positive change to you and your communities because you are the seeds that were watered well and expected to bear good fruits wherever you go,” Mrs. Kagame said. Mrs. Kagame asked students to help communities in curbing pressing issues including; early pregnancies, drug abuse and school dropouts. “During the liberation war, some liberators of this country were even younger than you, but they had love for the country. Now they produced you and have much trust in you. Use the skills you got from trainers to give hand in solving community problems like early pregnancies and school drop outs,” Mrs. Kagame said. Imbuto Foundation selects best academic performing candidates from vulnerable students for scholarship in local schools under its project Edified Generation. According to Mrs. Kagame, 681 students were given scholarships under ‘Edified Generation project this year. She requested them to work hard and keep good academic records. “I thank students who performed well this year and encourage those who had poor marks to work harder by reading books, asking parents and fellow students on possible ways of getting good grades,” Mrs. Kagame said. Since its inception in 2003, Imbuto foundation has sponsored over 8200 students both boys and girls. Jean de la Croix Ntiruginama, a student at Kigoma secondary school in Ruhango district was thankful to the First Lady who helped him to go to school. “You are a parent to me and all of us here, you gave me hope of studying when I was desperate,” he said. ‘Edified Generation camp attendees this year built 25 kitchen gardens and toilets for the vulnerable communities in Busasamana sector of Nyanza district.